1. Thanks, I'll take a look at that ticket later this week. 2. Could you post a diff of your changes to a new Issue Tracker ticket please? 3. Not sure how easy this would be to add at this point, please put this into another new Issue Tracker ticket so we can look into it. 4. The phone number shows up in the main Customer Information panel and is tied to the record, where else would you want to see this information show up exactly? I will post the code changes for the email. I will also look at the code more closely to see where the screen is being cleared when the session ends. Regarding the phone number, I honestly haven't move out of the chat tab in any of my previous testing. I will pay more attention to other screens tomorrow and report back. I added email(with a new show_email option) to the chat_customer options in svn/trunk, I also fixed a few bugs in related agent and email processes while I was testing things. It didn't occur to me to check the main information tab but just as you said the data entered by the customer was right there and I could also add address, country, comments, etc just like a call, which is WONDERFUL! 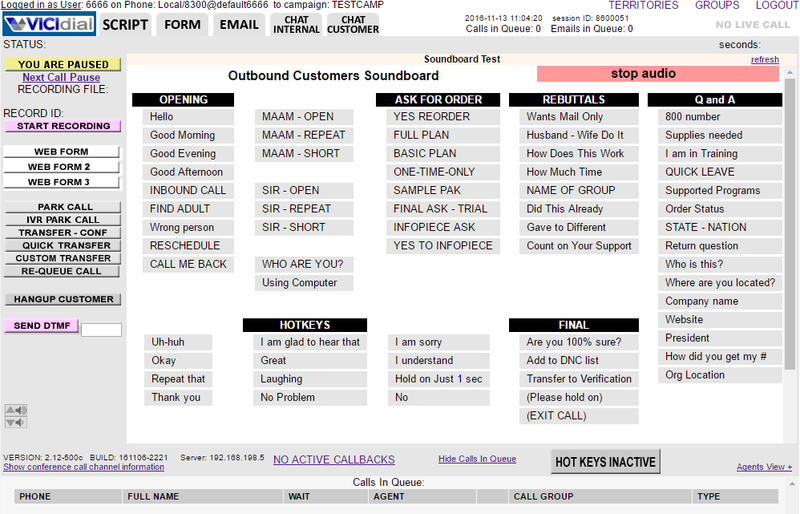 I added the ticket to the tracker about the customer side chat history being cleared when the session ends. How can dowload the code? Make sure you read the UPGRADE doc if you are upgrading an existing system. mflorell wrote: We do not put "sponsored by" logos in ViciDial. Any quotes assume full code release through the AGPLv2 license. If you want locked code we triple the price. If it is a truly custom solution that holds no value to the project, or requires security integration we will not charge triple for the development and we will not release the code. Does this mean we should expect to see all the customizations required to use the existing Avatar/Remote Agent capabilities and perl scripts in our distros? From what I understand, this is only available on a hosted installation through vicihost? We don't have any plans to release the VICIhost Agent Audio Soundboard interface code because it is part of our vicihost hosted infrastructure. Although you can build your own similar interfaces using the existing VICIdial functions just like the PoundTeam and several other companies have. The VICIdial Agent Audio Soundboard is now included in the VICIdial codebase, just upgrade your system, activate the feature in System Settings, and you've got it. There are NO customizations required to the vicidial code to use an Avatar module. The Avatar is an Add-On only (extra files, nothing in Vicidial is altered). Is there any planning step to integrate with social media? Your best bet there would be to build a social media watcher that generates email when there's activity and accepts email to post responses ... then vicidial already handles email so you're done. In that way ANY social media method could be integrated with NO changes to Vicidial. There are no plans to integrate with social media at this time. Given how both Facebook and Twitter treat developers and their behavior with restricting API access with very little notice, we really don't want to spend a lot of resources building something that could be shut off at any time. OK. Thank a lot for you. From the other side: do you have any information if whatsapp voice calls give the ability to connect with it so the call center can receive calls from whatsapp? I have never used whatapp, so I wouldn't really know. Since they are owned by Facebook, and their protocols are closed, I wouldn't imagine you would ever be able to directly interoperate with them. Being able to handle what's app communication is the only 'social' channel i would really like to see in ViCidial. It's the only really serious communication channel in The Netherlands and i expect many other countries. Over 60% (9 million) use it in The Netherlands and over one billion people world wide. For me personally it has replaced text messaging and i see more and more companies starting to use what's app as servicedesk channel. You should really try it Matt! If Whatapp had an official API, and supported integrations with outside software, I would be all for it. Unfortunately, they do not, and in fact they have said many times that they will not release an API for third party developers. "WhatsApp threatens legal action against API developers"
Since we are open source this is a real concern for us. Hacking a proprietary protocol to interact with it is not something I want to have to maintain either. Now that Facebook owns Whatsapp, I trust them even less, given how Facebook has treated their API partners in the past. And then there's the future to think about as well, Facebook paid 19 billion dollars for Whatapp, they are going to want to monetize that investment at some point, and when they do, it's going to get ugly for anyone circumventing their technology. And of course it doesn't help that my Skype account from 2008 was set to inactive and Microsoft refuses to make it active again. The problem with all of these technologies is that they are proprietary, closed-standards designed to only work with their internal applications. There is no guarantee that they will work with any other systems, or if someone does manage to get them to work that they will keep working for any length of time. Hmm no that all doesn't sound very encouraging. Why the heck did they disable your skype account. My skype account is from 2004 and still active. They said my account had been "hacked", and they would not accept any of the account recovery measures that I entered to try to reactivate it. I've never had an experience like that before actually, it was very frustrating. mflorell wrote: If Whatapp had an official API, and supported integrations with outside software, I would be all for it. Unfortunately, they do not, and in fact they have said many times that they will not release an API for third party developers. Exactly why it's simpler/easier/more legal to use the email integration and a black box system. It would be outside the Vicidial Project and small enough to avoid direct action. If installed directly on smaller systems (as opposed to being part of a larger core like asterisk or vicidial), there would likely never be a challenge. And it's not like there aren't plenty of black box connection developers out there. Now that Vicidial has email integration, that just makes it a perfect scenario. "One-off" using email allows integration using ANY other media from text messaging to any social app. Hi Bill, can you give an example of such a black box system? So that would mean when someone sends a what's app message you get an email with that message? Due to the chat characteristic of it how would that work on the agent side? You have to wait for each response for a new e-mail to get in? You need a functional mail parsing system (and perhaps postfix to catch the email). Then you need something that will cause email to be generated so that system can "catch" the email. If the provider has an API and does not send emails triggered by updates, you may need a bot of some sort to watch the feed (Atom? RSS? anything that can watch the data feed in question and generate some sort of trigger event). After that you can use php or perl to parse the email and extract what happened and who should be notified ... and send that off to Vicidial's inbox for the Campaign in question. And of course on the return trip you have to do everything backwards unless you create a Script pane that puts the proper site in place for the agent to post directly. But, for instance: Doesn't your Thunderbird/Outlook (or other) mail client have a Filter that can Forward? And in the case of Thunderbird, that's open source. There are plenty of apps that can parse an email for information and perform an activity based on the results. Our Redmine project manager/ticket system parses emails to post responses to ticket notifiers ... many other ticket systems do the same thing. When other vendors like AVAYA and Cisco are saying that they have Social Media product which is ready to work with twitter and facebook, so how they do this if twitter and facebook are closed? Does it means that they opened only for certain vendors? Twitter and Facebook do offer conditional APIs, and they have commercial partners with large companies. Some of the APIs are open, but they have a lot of qualifications, and they can change the terms at any time with no notice. We don't really have the resources to commit to interoperating with a platform like that. After all: If an interface were added to Vicidial for Twitter, and you began using it ... then in the middle of the day next Thursday it "just stopped working" ... now what? A 3rd party interface would be Maintained, and an Update would be issued by that third party only if there were incentive ($$) to keep that interface updated. In My Opinion (and I don't work there, so take it as opinion): The Vicidial Group is unlikely to commit to free updates to a half dozen "we can turn this off or change it any time we feel like it" data pathways unless someone specifically sponsors each one (including keeping $$ on the account for any sudden, middle of the day updates and/or attention to the necessary news feeds and forums for upcoming changes). My opinion, of course, is formed on the fact that this is OUR policy as well. The difference is that anything we do like this would need to be external to maintain upgradeability (ie: an external app that converts all this data exchange to Email or Chat data). The Vicidial Group could actually blend it in to the core, but that's a lot of work for something that could die off at any time (like vTiger integration, LOL). We just added some new features to chat, including user nicknames for chat, custom logos for customers, alternating background colors in the chat log and the ability to offer a survey link when the chat session has completed. Great! I will upgrade our test dialer on Friday to see the changes. Can we easily copy text from the chat now? Yes, agents can copy from chat much easier now. hello ive been trying to set it up so that my agents can chat to each other but for them to do that thir end its rather messy and dont allways work is thir a correct way of setting it up to alow this all the time ?? and my agents want to messige me out of the blue .. atm agents can onley chat to me if i start the convo first is thir a way for them to chat start chatting to me with out me having to loging in the the dilers side ....ide sooner just use the admin panal chat ?? As far as agents chatting with each other, they can do so by going to the "CHAT INTERNAL" tab. There is a green button labeled "CHAT WITH LIVE AGENT", and by clicking on that your agents can select a live agent from a drop-down menu and initiate a chat with them through it. Is this the method you're using? If so, what kind of messy problems are you running into? Also, there is currently no way for agents to message managers - initiating a chat between the two can only be done by the manager, partly because the dialer currently doesn't track if a manager is currently using the admin interface in general or the manager/agent chat interface in particular. Currently if managers wish to be available to agents, they need to log into the agent interface and the agents can contact them this way. jjohnson78 wrote: As far as agents chatting with each other, they can do so by going to the "CHAT INTERNAL" tab. There is a green button labeled "CHAT WITH LIVE AGENT", and by clicking on that your agents can select a live agent from a drop-down menu and initiate a chat with them through it. Is this the method you're using? If so, what kind of messy problems are you running into? mattyou1985 wrote: hello ive been trying to set it up so that my agents can chat to each other but for them to do that thir end its rather messy and dont allways work is thir a correct way of setting it up to alow this all the time ?? Be sure to run any DB updates! Don't leave the DB with older code than the running scripts. also: I think Vicibox 7 has an upgrade feature. mflorell wrote: We just added some new features to chat, including user nicknames for chat, custom logos for customers, alternating background colors in the chat log and the ability to offer a survey link when the chat session has completed. Hi Matt, how do i change the chat logo? Also a question, why is there a button for the agent to end a chat and also to hangup? 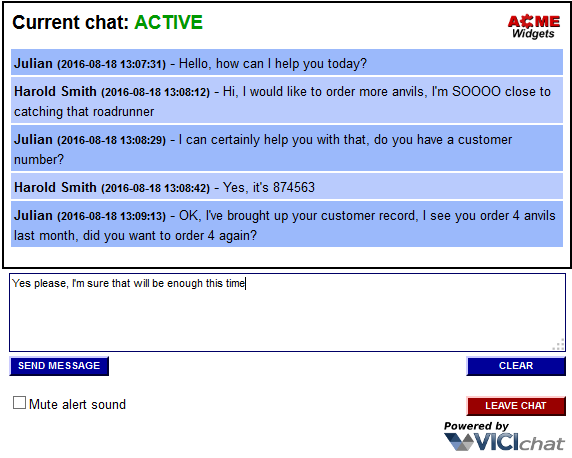 Is it possible to chat with more then one customer at once? The logo is part of the Screen Colors that you can now set in a Chat Group. There was originally a plan to do multiple custom chats at once, but it proved to be very complex, so that's why the button is there. Thanks Matt, got it working. Is it possible to change the logo in the agent screen as well or that not implemented yet? There are x customer(s) in the chat queue ahead of you. Also for some reason i assign the chat ingroup as a default group to my test agent every time in the user settings but once the agent logs in he has no access to that chatgroup anymore and i have to give the agent access to the chat group via the realtime report. What could be causing this? I have noticed the chatscreen isn't working anymore either for the logged in agent, the chat tab is blinking but when i click on it i just get a screen that says Customer Chat Frame. I tried reverting back to English (was using Dutch) but didn't make a difference. I just tested it with the "Agent Choose Ingroups" setting at "0" and with a chat group checked as a preselected ingroup, then did a test chat via that ingroup and it went to the agent fine once I un-paused the agent. What do you mean when you write "he has no access to that chatgroup anymore"? Access where? If you set it so that the ingroup is auto-selected by default they shouldn't have access to it anymore, and you shouldn't need to assign it to them via the realtime report - are you sure you have set up the preselected ingroups properly? The reason I ask is, you SHOULD see the chat ingroup already highlighted in the realtime report if you set it up correctly in the agent's settings. Did you check the box by the chat ingroup under the "Inbound Groups:" section on the "MODIFY A USERS RECORD" screen? Those phrases were not coded to be translated, but we just fixed that in svn/trunk so you should be good to go after an upgrade. As for the other issue, we couldn't replicate on our system given the steps you outlined.